In terms of formal unity before the 2019 elections, former president Cristina Fernández de Kirchner remains the limit for most of the Peronist movement's major leaders. Peronist leaders seemed one step closer to "unity" on Wednesday during October 17- Peronist "Loyalty Day" celebrations in Argentina's north. In Tucumán, those opposed to her participation in a possible alliance for the 2019 general and presidential elections rallied around a message of "unity". 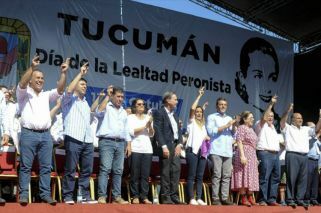 "I ask all comrades, without exception: Peronism in 2019 must be united", Tucumán governor Juan Manzur urged the some 60 thousand people gathered at the event. Curiously, Manzur closed the day's events asking the crowd to recognise, through a round of applause, "all comrades" celebrating Loyalty Day yesterday. Kirchner-alligned Peronists were meeting in Corrientes and the movement's traditional bastion, Buenos Aires province. Manzur's request received a mix response from his "comrades" on stage. Traditionally a Motely crew of personalities, ideologies and leadership styles, the Peronists once again showed their ability to reconstruct broken alliances. Among those on stage were former Buenos Aires province governor Daniel Scioli and dissident Peronist Sergio Massa, who came in second and third in the 2015 presidential elections on competing tickets, respectively. National lawmaker Scioli formally sits with Fernández de Kirchner's voting bloc in the Lower House. Others in attendance were Miguel Angel Pichetto and Vice-governor of Chaco province Daniel Capitanich. Wednesday's event marked a change in tone among some of the Peronist movement's key leaders. Speakers at the event were Manzur; lawmaker for the centrist Renewal Front in Congress, Graciela Camaño; and CGT leader Héctor Daer. "To hell with the niceties, they (the Macri administration) are ruining us by mortgaging the country", Camaño said. "Never again a neoliberal (government)", she urged. "The priority is unity. Let's make sure that our differences don't mean they beat us again by one percent", Daer said, in reference to the 2015 run-off presidential vote in which Daniel Scioli lost to President Mauricio Macri by one percent. In Corrientes province, the day's event was dominated by Peronist leaders with strong ties to Fernández de Kirchner whose message of unity "without leaving anybody aside", according to national Peronist Party (PJ) leader José Luis Gioja, has so far failed to entice the rest of the movement. Gioja was joined by Kirchnerite lawmaker, the head of FpV's Lower House bloc Agustín Rossi, who is a 2019 presidential hopeful. "No one has the ability to say: With this person yes, with this person no. This is because Macri's austerity agenda is for all Argentines, no matter who they voted for in 2015", Rossi said. Fernández de Kirchner supporters were also on show in Merlo, in the east of Greater Buenos Aires, Peronist heartland, where the party's provincial leader Gustavo Menéndez was joined by national lawmakers Fernando Espinoza, Máximo Kirchner, Mayra Mendoza, Andrés Larroque, Wado de Pedro and Axex Kicillof. "For those asking who was coming and who wasn't: everybody's here", Menéndez told the crowd, ironically. "We will show the entire country that Peronism in Buenos Aires province is as united as ever", lawmaker Espinoza said. Several mayors were also in attendance including Jorge Ferrasi (Avellaneda), Marcelo Santillán (Gonzalez Chaves), Ricardo Casi (Colón) and Walter Torchio (Carlos Caseres). Among trade unionists were Roberto Baradel (teachers, SUTEBA), Omar Plaini (newspaper vendors) and Hugo Yasky (CTA).